Posted 25 March 2016 by Richard & filed under Biographies & Pen Portraits. The Industrial Revolution was a significant characteristic of life in Britain during the 18th century. Major rapid changes occurred across many areas e.g. machine-labour in factories took the place of hand-labour in people’s homes and large-scale agriculture based on scientific principles replaced the medieval system of tillage on small plots of land. This Revolution was a process and not a single event, it had no sharply defined stages, and nevertheless we can say that it had taken hold by 1783 when it was being generally introduced and applied in most leading industries at the time. In 1784 the invention of the power-loom marked the application of water-power to weaving which was the last main process of the textile industry to be power-driven. In 1785 the application of steam for driving spinning machines foreshadowed the wider development of factories using steam-power which subsequently changes the face of Britain. This revolution in industry had results that continued into the 19th century. The introduction of machinery which replaced hand-labour caused unemployment and the consequent distress. Unemployment coupled with low wages paid to the factory workers, because of the oversupply of labour enabled the employers to pay low wages. In addition child labour formed a significant proportion of the labour force the children working to supplement family incomes. Later with the expansion of international trade made Britain became very wealthy although this wealth was concentrated in few hands. The money was very often used to fund wars and subsidise her allies. As a result of the creation of the manufacturing base for the country agriculture experienced major changes and challenges. For example to be profitable farming had to be a much larger scale. Consequently the yeoman-farmer i.e. the farmer who was neither a large land-owner nor a tenant of a farm owner and worked his own land was in most instances forced to give up his farm. He would then become a labourer for a more prosperous person who had been able to buy his farm or move to a town to become a factory worker or to join the ranks of the unemployed in the towns. The disappearance of the yeoman was but one of the significant changes brought about by the Industrial Revolution. 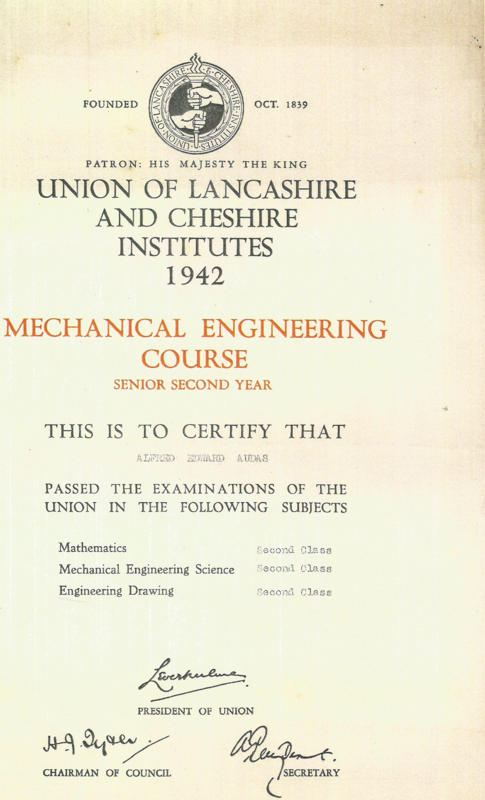 Source: Lancashire and Cheshire Institutes Examination paper for English in March 1939. Posted 24 March 2016 by Richard & filed under Biographies & Pen Portraits. These were kindly sent to me by Pam Cruise and gained by her Uncle Alfred Edward Audas. 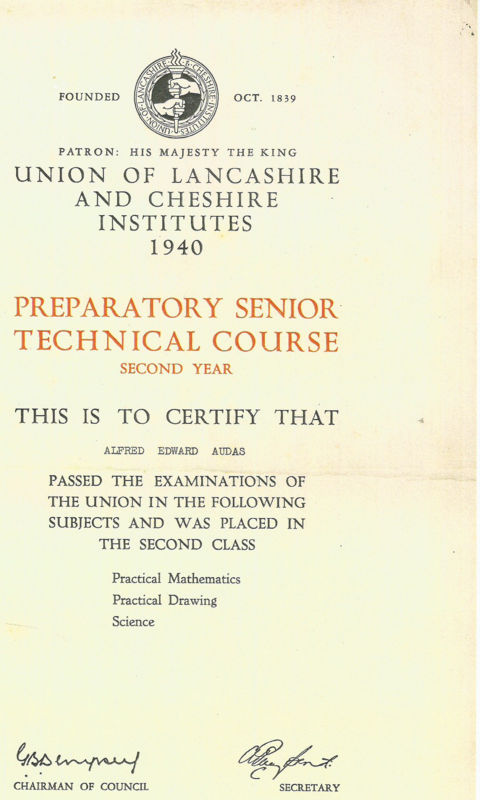 After graduating he worked as a draughtsman at ICI in Warrington. I am very grateful to Pam for her generosity. An uncle to be proud of. 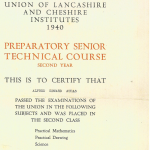 They provide a fascinating insight to how the examination board recognised achievement. 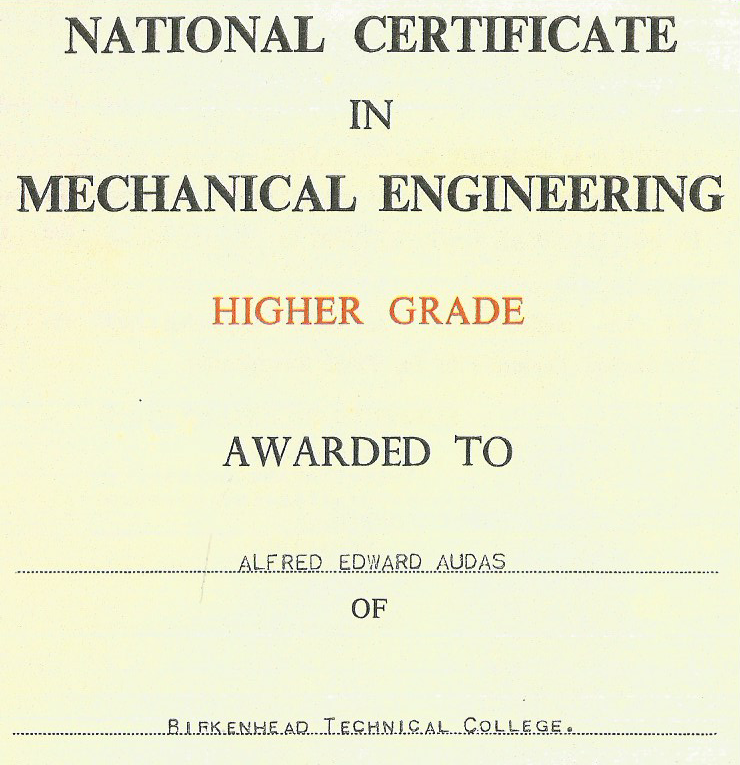 Alfred studied for this award at Birkenhead Technical College. 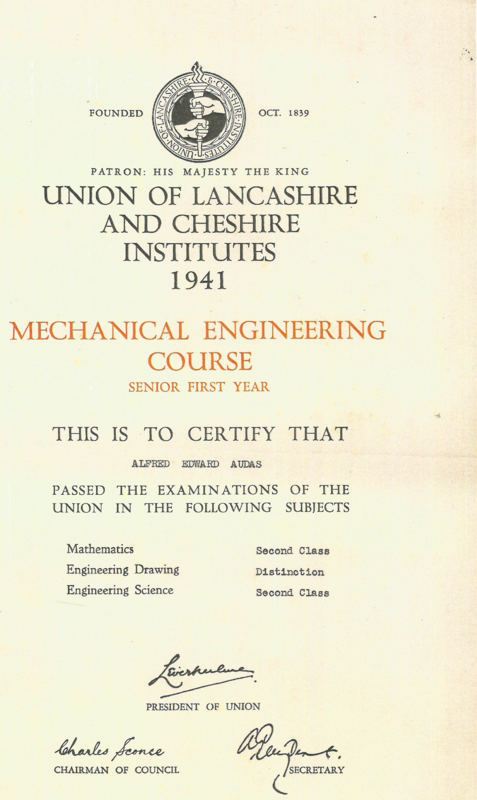 Union of Lancashire and Cheshire Institutes. Posted 14 March 2016 by Richard & filed under Biographies & Pen Portraits. 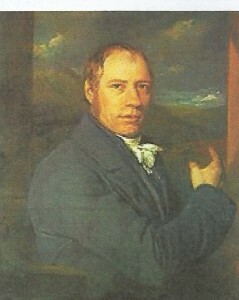 Richard Trevithick, (image shown opposite), deserves a place alongside the other pioneers of steam engine developments like Thomas Newcomen and James Watt. He is credited with inventing the first high-pressured steam engine and the first operational steam locomotive (1803). He was born in Carn Brea in Cornwall which was at the centre of the then thriving mining industry in the county. His father was a mine captain and whilst attending Camborne School Richard became fascinated by the industry. In 1786 there were 21 Boulton and Watt steam engines operating in Cornwall and he learnt how they were designed and worked. He was a very confident and enthusiastic individual and because of his height became known as the Cornish giant. He started work at the age of 19 at the East Stray mine near Camborne under the supervision of William Bull who manufactured steam engines which were different from Watts’. In order to avoid the inventor’s patent Boulton and Watt sued Bull over violation of the patent and Richard Trevithick appeared as an expert witness in opposition to Watt which increased the hostility between Trevithick and Watt. During the late 18th century many engineers were trying to improve the efficiency and effectiveness of steam engines. Watt was very sceptical stating that they ‘were all on the wrong track’. Trevithick struggled financially but was supported by his cousin Andrew Vivian and gained a great deal of scientific guidance from Davies Gilbert the MP for Penzance and Bodmin. Gilbert offered advice of how the steam pressures could be best operated in regard to the pistons and the cylinders. Gilbert went on to be elected president of the Royal Society succeeding Humphry Davy – note again the Cornish connections. 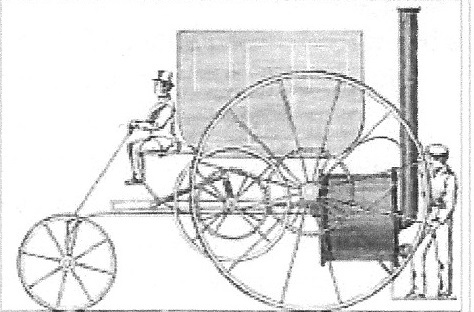 In 1796 Trevithick constructed two steam engines, one to drive a locomotive, the second a free standing/static engine. These were much simpler than the Boulton and Watt engines and delivered greater levels of power. He further developed these engines to drive winding wheels at Wheal Hope mine and quickly realised their potential because of their relatively small size, lightness and power capability to drive vehicles. On 24th December 1801 he drove a single-cylinder steam engine called the ‘the Puffing Billy’ in Camborne for a distance of one kilometre. In-spite of the short distance the event proved a great success which heralded a new age of faster travel. Initially the distance travelled was limited by the great consumption of water but further improvements with his partner Vivian overcame this and other problems. A picture of ‘the Puffing Billy’ is shown below. In 1803 he decided to demonstrate his steam carriage in London when trials were staged at Lord’s cricket ground and then down New road and Gray’s Inn Lane. However these ambitious demonstrations had limited success which caused some of his financial supporters to doubt the engines true potential. Four fatalities occurred when one of his pumping engines exploded and this caused further reservations prompted by Boulton and Watt’s heavy criticism of Trevithick and his inventions – such was their hostility to him! 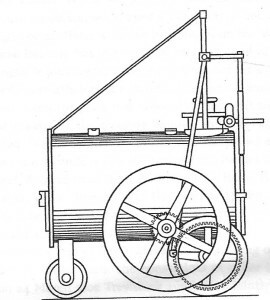 A picture of the London Steam Carriage locomotive by Trevithick and Vivian that was demonstrated in 1803 is shown below. However again help was on hand when Samuel Homfray owner of the Pen-y-darren ironworks in Wales bought the rights to some of the patents. In 1804 a new more powerful engine was used to win Samuel Homfrays bet that the engine could pull ten tons of iron along ten miles of tramway. This and other successes allowed Trevithick to continue his work on improving the steam engines both static and for locomotion. These steam locomotives would ultimately transform steam engines and allow a faster and safer mode of travel. In addition he developed a wide range of static steam engines used in boring, crushing, dredger (1806), iron rolling and milling (1805), pumping, threshing machine (1812) etc. He also developed a marine engine to drive paddle steamers as well as telescopic masts, buoy and floating docks. Successful as he was with his inventions he possessed poor business sense and financial skills and experienced a number of bankruptcies. Three years after bankruptcy in 1811 an order for his engines was made by a silver mine in Peru and he decided in 1816 to seek his future and fortune in South America. In South America he again showed his extraordinary ability and enthusiasm being prepared to throw himself into all sorts of challenges and projects. He was appointed as an engineer in Lima but then the war of independence broke out. He served in Simon Bolivar’s army and then travelled extensively in Colombia, Costa Rica and Ecuador hoping to develop mining machinery and identify routes to transport ore and equipment but the independence wars that were sweeping the continent greatly curtailed his ambitions and he returned to England in 1827 penniless only to find other engineers had profited from his inventions including George Stephenson. George Stephenson however recognised Trevithick’s achievements and petitioned Parliament to give him a pension but this request was refused – another example of the commitment by politicians’ to technical and industrial development! He died in poverty in Dartford on 22nd April 1833 and buried in an unmarked grave. A truly remarkable individual who has not received the recognition he deserves. Having lived and worked near Carn Brea and Camborne in Cornwall I know how much he is revered. There is a Richard Trevithick Society which publishes newsletters and journals on him and the mining industry. Burton. A. ‘Richard Trevithick: Giant of Steam ISBN 1-85410-878-6. London. Aurum Press. 2000. Dickinson. H. W. and Titley. A. ‘Richard Trevithick.’ CUP. 1934. Dickinson. H. W. and Titley. A. A Short History of the Steam Engine.’ CUP. 1938. Posted 16 February 2016 by Richard & filed under Biographies & Pen Portraits. Eleanor Marx was a remarkable individual who contributed to a number of causes and influenced not only her own generation but later ones. She was the youngest daughter of Karl Marx, born in London on 16th January 1855. By the time Eleanor was sixteen she acted as her father’s secretary, accompanying him to international conferences on socialism. She contributed to many movements during her relatively short life in many campaigns including those associated with the creation of trade unions, workers education, working conditions in factories and female equality. Many of these campaigns were associated with the education of workers. She was a rare example of someone who was able to combine theory and practice. Below I will try and record some of her campaigns and achievements. She was an exceptional researcher and translator spending long periods in the British Museum Reading Room but was not afraid to initiate and get directly involved and lead from the front in campaigns e.g. she was an active strike organiser and union administrator e.g. secretary of the National Union of Gas Workers and General Labourers of Great Britain and Ireland which later merged to form the General and Municipal Workers Union, and then became the GMB. Eleanor was very committed to the formation of trade unions seeing them as a positive mass movement representing skilled and non-skilled workers. Initially the trade union movement and membership was exclusively for skilled workers who were resistant and hostile to membership of non-skilled workers. In 1889-90 she supported and mentored the head of the National Union of Gas Workers and General Labourers during a crucial strike and established the first women’s branch of that union. Her very detailed research led to many seminal lectures and pamphlets e.g. drawing attention to the ineffectiveness of the Factory Acts (1) which were supposed to improve the working and employment conditions in factories and provide basic education to young workers. In 1884, Eleanor joined the Social Democratic Federation (SDF) and was elected on to its executive. Her involvement in the SDF played a key part in advocating and supporting workers’ education. In 1876 Eleanor Marx became an active campaigner for female equality when she helped a female candidate win a seat on a London School Board. In 1886 Eleanor got involved with the Women’s Trade Union League. She also got directly involved in the Bryant and May match-girl strike and in 1889 she became involved in the Dock workers’ strike. She served as an administrator and fundraiser for the Amalgamated Society of Engineers (ASE) and helped carry out the ASE’s campaign for the eight-hour day. Her range of activities was remarkable she was a gifted speaker, writer and knowledgeable on a wide range of subjects particularly economics through her major editorial role for her father Karl Marx’s works. She was an internationalist, translator and interpreter in French, German, Russian and English, interested in literature as well as politics. Hers was the first translation into English of Gustave Flaubert’s French novel Madame Bovary and she taught herself Danish so that she could translate Henrik Ibsen’s A Doll’s House. What made her particularly a special and effective campaigner and activist was that she instigated and remained committed to the causes that she fought for. “The Woman Question: From a Socialist Point of View.” (1886). “The Working Class Movements in America.” (1888). “The Working Class Movement in England. (1896). Before his death, Karl Marx had given Eleanor the task of preparing his unfinished manuscripts for publication. Eleanor also had the task of dealing with the English publication of Das Kapital . Eleanor was involved in translating and editing volumes of Kapital as well as editing Marx’s lectures “Value, Price and Profit” and “Wage Labour and Capital”. She also contributed many articles for Justice a political journal. 1898. Factory Acts. See Biographies on this website. Holmes. R. ‘Eleanor Marx’. ISBN 9780747583844. Bloomsbury Publications Plc. 2014. Tsuzuki. C. ‘The Life of Eleanor Marx 1855-1898. A Socialist Tragedy.’ Oxford Clarendon Press. 1967. Kapp. Y. ‘Eleanor Marx.’ Two volumes. Lawrence and Wishart. 1972 and 1976. I intend to expand this biography later. The period of the Industrial Revolution witnessed unprecedented changes and transitions in society. Massive numbers of people moved from the country to the emerging industrial cities and towns. People who previously worked on the land or in cottage industries (e.g. hand spinning and weaving) became workers in factories undertaking largely non-skilled manual jobs. The Revolution brought about both positive and negative consequences including massive pollution and overcrowded and wretched living conditions for these workers. The phrase “dark Satanic Mills” is often used to describe the early Industrial Revolution and its destruction of nature and human relationships (although this interpretation is often disputed). As a result of these negative consequences a series of Factory Acts were campaigned for by workers themselves and their radical supporters and established during the 19th century. These Acts were passed by the UK Parliament and addressed the conditions that workers routinely endured in factories and other workplaces e.g. coal gas production, office, typists, India rubber processing. The working conditions during the Industrial Revolution were hideous because the main aim of employers was to maximise profits. Workers were exploited through very low wages, long working hours, dangerous working environments. The wide spread disregard for workers’ health and safety included conditions associated with poor ventilation, lack of accident prevention, medical facilities and sanitation. Reasons given for the slow implementation of the legislation were that the pace of the Industrial Revolution was so great that employers were able to ignore or circumvent any regulations and inspection regimes. Other commentators characterised it as a typical example of English practical empiricism. However in retrospect whatever the reasons any analysis highlights that the impact of the successive Acts were largely ineffective and the eventual legislative enactment did take a long time. One of the first and articulate critics of the Factory Acts was Eleanor Marx in a series of seminal lectures and publications (1). She analysed in great detail the content and subsequent impact of successive Acts and starkly showed that the legislation was ineffective and mostly unenforced. She was a voice alone in highlighting and bringing these facts to the attention of the wider public. Eleanor was a leading figure in the creation of trade unions and advocate for the working classes including their education. A Factory Inspectorate was finally established in 1833 but again had little impact until much later. It was only after the 1860s onwards that more industries were brought within the orbit of the Factory Act. In 1910 Sidney Webb, an influential economist, reformer and co-founder of the London School of Economics and active member of the Fabian Society stated that the Factory Act and its associated legislation had been ineffective and were only then becoming effective. Note: The early Acts mainly concentrated on regulating the hours of work and moral welfare of young children employed in cotton mills. Later Acts extended their remits to other industries and issues associated with factories and the workers including women and apprentices. 1802: Health and Morals of Apprentices Act. This limited the workday for apprentices to 12 hours. 1819: Cotton Mills and Factories Act. Cotton mills could not employ young people under the age of 9 and limited workdays for 9 to 16 year olds to 12 hours. Key figure Robert Peel. 1825: Cotton Mills Regulation Act. 1829: Act to Amend the Laws relating to the employment of Children in Cotton Mills & Manufactories. 1832: The first ‘Ten Hour Bill’ – Sadler’s Bill (1832). 1833: Labour of Children, etc., in Factories Act – Althorp’s Act. This extended the 1819 Act to all textile mills except silk and lace. No child worker under 9 years of age. Workdays for children 9-16 years old limited to 8 hours and for 13-18 limited to 12 hours. In addition children could not work at night. Interested to note young people under 13 had to receive education for 2 hours per workday, paid for by the worker. 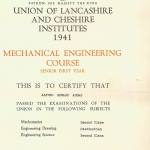 Employers were also required to have an age certificate for young workers and four factory inspectors had to be appointed to oversee the regulations and law. 1842: The Mines Act. Women and young people under the age of 10 prohibited from working underground. 1843/44: Graham’s Factory Education Bill. Act limited to textile mills. Workday for women and young people aged 8 to 13 limited to 6.5 hours a day. Young people had to receive a minimum of 3 hours education each day. Women prohibited to undertake night work and limited to 12 hours of work Women forbidden to do night work and limited to 12 hours of work. 1847: Factory Act. Workday for women and young people aged 13 to 18 limited to 10 hours a day or 58 hours per week. 1850: Factory Act – the ‘Compromise’ Act. 1853: Employment of Children in Factories Act. Young people aged 8 to 13 could not before 6 am or after 6 pm, or 2 pm on Saturday. 1856: Factory Act. National Association of Factory Occupiers to enforce adherence of the regulations and laws. 1867: Factories Act Extension Act and Hours of Labour Regulation Act: Extended earlier factory legislation to include non-textile factories and workshops. The Act prohibited the employment of young people less than 8 years of age. Young people aged between 8 and 13 had to receive a minimum of 10 hours of education per week. 1867: Agricultural Gangs Act. Prohibited the employment of young people under 8 and the employment of women and young people in a field gang that included men. 1871: Factory and Workshop Act. 1895: Factory and Workshop Act. Review the impact and effectiveness of the previous Acts. As can be seen from the above detail successive Acts dealt with the same issues and in some cases reviewed the enforcement or lack of the legislation in earlier Acts. For example the various Acts often advocated education for children workers BUT did not say how this was to be operated or inspected. See biography on website . I intend to expand this topic later. Posted 25 January 2016 by Richard & filed under Articles. The City and Guilds Institute of London (CGLI) has developed a new qualification namely a TechBac. Everyone interested in education knows that the current education and training system is failing to deliver the skills needed for employment and the workplace. There is now a consensus amongst educationists, employers, parents and students that the curriculum is too narrow and academic. In addition the curriculum is dominated by over assessment and examinations regimes which further deflect the teaching and learning process from its true purpose. A great deal of time is spent preparing for assessments and examinations and an obsession with national league tables. The curriculum is very much prescribed and allows teachers and students little freedom to explore wider issues. Little attention is given to the soft skills like, communication, managing one’s own learning, mentoring, numerical and financial literacy, problem solving, and working in teams. Also little opportunity exists for meaningful work experience programmes and hence the gaining of knowledge and the necessary skills required for the workplace. A recent survey of employers showed that 77% of them thought that a work experience prepared the learners to be more work ready. Previous attempts to introduce vocational elements into the curriculum have largely failed e.g. 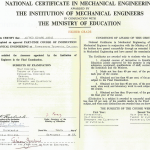 CPVE, GNVQs, vocational diplomas and the TVEI because they did not find favour with one government or another. 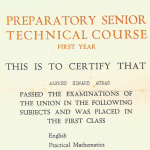 The development of a Baccalaureate type qualification in this country has had a chequered history. The proposed British Baccalaureate in 1990 promised much being sponsored by the Institute of Public Policy Research (IPPR) and a number of Labour politicians including Tessa Blackstone but was quickly dropped when the Labour party was subsequently elected in 1997. The debates after the publication of the British Baccalaureate centred on the sanctity of ‘A’ levels and as usual their supposed gold standards, and indeed those of the GCSEs which continued to reign supreme. The curriculum maintains its academic bias still today. Other attempts to introduce a baccalaureate failed (see article ‘The TechBacc- What Chance of Success’? (1)). So it is with great interest that the City and Guilds (CGLI) are developing a new qualification for 14 to 19 year olds called the ‘TechBac’ and have argued that the award will create the technical and professional skills needed for the modern workplace. In addition the award will offer progression to apprenticeship programmes and to further and higher education and training. The Institute has worked closely with industry to gain endorsement of the award as well as helping to develop the specification to create the skills that employers want from their employees. Employer involvement has been significant at the design, recognition, and assessment stages which will engender credibility with employers, parents and the learners themselves. The award is available at level 2 and 3 with different sizes of units to fit the learner’s study programme and can be delivered in one or two years. The award has been approved by the Department for Education (DfE) and will attract UCAS points and will be published on national performance tables. The TechBac comprises two main elements: technical skills; and transferable skills and workplace behaviours. The technical skills have been designed to meet the latest industry needs and standards and to be rigorous and delivering high quality practical learning. The professional transferrable/workplace skills aim to develop, accredit workplace skills and help the learners to be more confident, competent and ready for employment in the world of work. The award has also introduced a reduced assessment burden with an interesting grading profile namely grade 1: outstanding, grade2: good, grade 3: requires improvement and grade 4: inadequate. The Technical Certificate (TC) will consist of 360/450 Guided Learning Hours (GLHs) made up of 30/60 GLH units. A pass of the Technical Certificate (TC) will allow progression to an apprenticeship programme or onto a level 3 Technical Level Qualification (TLQ). The award comprises a set of mandatory content which must make up at least 40% of the qualification. 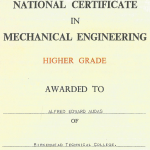 A proportion of the awards will be assessed externally with a minimum of 25% for the Technical Certificate (TC) and 30% for Technical Level Qualification (TLQ). The award will include a practical work experience programme which will allow the learners to monitor, evaluate their work placement and encourage the placement providers to improve the quality of future placements. In addition an assessed project qualification which will help to develop the learners’ independent study skills. Soft skills will also be assessed which are not currently accredited by other qualifications. The award will be available to schools and colleges and will offer provision for 14 to 18 yea rolds. Clearly there are many challenges in introducing the award. It will face the same issues that have dogged previous attempts to introduce vocational elements in the curriculum. It must be strongly promoted and endorsed by the government, employers, customers and educationalists. Education and training providers must provide clear, honest brokership and open information, advice and guidance to prospective student’s i.e. articulate ambassadors to champion the new award. Hopefully it will succeed and realise parity of esteem with existing awards. It will be introduced in 2017. Up to 16 >CORE +EBacc GCEs+3Technical Awards or non-core GCSEs +Additional GCSEs or Other qualifications. 16 to 18 >‘A´ levels/Applied Generals/Tech Levels/TechBac/Technical Certificates/Apprentices/Traineeships. Mixed programmes can also be taken i.e. 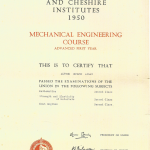 blend of Applied Generals, ‘A’ levels and Technical Qualifications. 18+> Higher Education or Apprenticeship or Employment. The above is a classic example of a clustered and confusing qualification landscape so typical of this country. Posted 24 January 2016 by Richard & filed under Viewpoint. Apprenticeships still occupy a central part of the skills agenda, but will all this discussion bring about the high quality frameworks that are now urgently required? The main political drive seems to be to create large numbers of apprenticeships, but with little reference or debate about the quality and fitness for purpose of the programmes. These two elements are surely the most important and should not be subverted by political hype over the numbers taking them up. Too often politicians get carried away quoting numbers, imagining the larger the number, more of the population will be conned into believing their commitment to an issue! It’s the old issue of quality verses quantity. Significantly, however, one aspect of the government’s namely the Trailblazer initiative, which was launched in March, looks promising and could create effective apprenticeship programmes. A number of key professional bodies have been very actively involved with the initiative including the Chartered Institute of Plumbing and Heating Engineering (CIPHE). Other Trailblazer programmes will be launched over the next few years and will represent other profession and trades. Colleges and college lecturers want to play a key part in developing and delivering high quality apprenticeships, working closely with employers and the relevant professional organisations. The CIPHE has led the way with involvement in the Trailblazer initiative, which allows employers to be involved in designing the programmes and equally important, directly defining and developing the skills that their workers need now and in the future. The knowledge, skills and behavioural specification is comprehensive and provides a strong foundation for practitioners of the future. The specification fully recognises the importance of mathematical, scientific and equally important the practical and behavioural skills needed along with the wider core/soft skills. 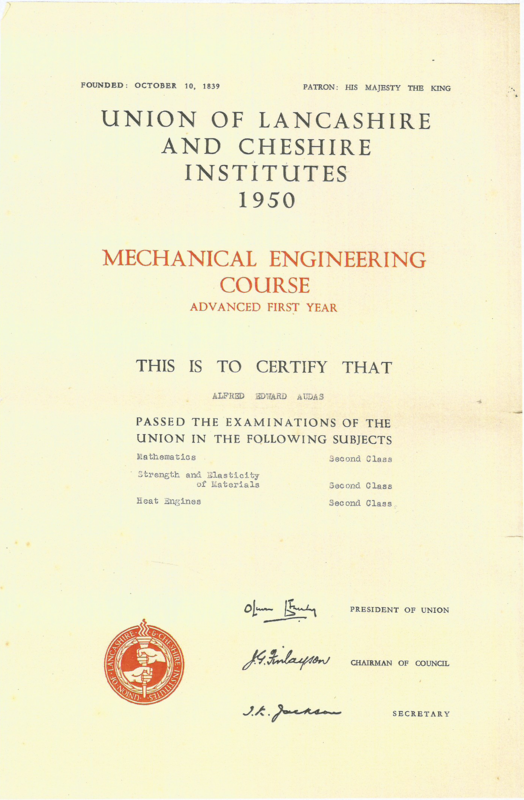 Finally on graduation a clear progression career route is defined by the award of EngTech, accredited by the Engineering Council in association with CIPHE. This sets the scene for practitioners to progress to higher professional memberships e.g. Incorporated and Chartered Engineer following work experience and Continuous Professional Development (CPD). It is hoped the Plumbing Trailblazer programme will be formally launched in 2017. I am relatively optimistic about the initiative and hope that colleges will be significantly involved in the delivery and further development. This development will benefit the students, employers and colleges and raise the profile of the professional status of plumbing and heating engineering. Hopefully other professional and trade associations will develop their apprenticeship programmes. (Productivity is a measure of the efficiency with which available resources are used in production). Current debates about rebalancing the economy and the ability of the country to compete in the global market constantly highlights the low current productivity levels in the manufacturing industry. The need to increase exports significantly in the future is crucial to this endeavour. International surveys over many years have shown consistently that we lag well behind most of our international competitors. For example for the G7 nations Britain was on average 17% less productive and an often quoted statement is that France is 20% more productive than this country i.e. they achieve in four days what we do in five. The OECD report in 2014 also highlighted that the country had become even less productive, decreasing by 3% per hour between 2007 and 2012. Even accepting the complexities associated with the factors in play when defining and measuring productivity and the confusing array of the resulting statistical interpretations, the reality is that the country is performing poorly. A recent report has identified the need to increase exports to £1 trillion by 2020, but the indications already show this target is unrealistic and is very unlikely to be achieved falling short by at least 30% There are a wide range of complex and interconnected causes in play creating these problems, including low investment in research and development (R&D) and poor innovation and creativity skills. The solutions will take a long time to reform and implement and will require radical approaches, free from political dogma and micro-management. One essential element is the need to develop high quality technical education and training following these reforms and again the FE sector must be significantly involved. So what are the factors that have created low productivity? As already mentioned there are many dimensions, including the inadequate resourcing and support of technical and vocational education and training. The country operates a low skill/ low wage/high employment policy, which increasingly depends on immigrant workers, who are prepared to work for low wages. Other factors include workers’ motivation, the work environment, pay, conditions of service, the paucity of CPD and the quality of leadership and management. Recent surveys show that a large number of office workers spend a great deal of the working time using the internet, Facebook and twitter for their own purposes. This is a very sad statement about the workers commitment and loyalty to the company and also reflects poor management and supervision. This contrasts with the China when a recent survey showed that 60% of the Chinese workforce work overtime voluntarily. Many commentators argue that to maintain a productive industrial base, some unemployment is necessary but also underpinned by an effective and efficient technical education and training system. Investing in our own education and training system is essential. After all, I would argue that taking people from abroad can be seen as unethical, where often poorer countries have invested in their own people and then to see them poached by richer countries. I accept that social and economic mobility is a fact of globalism, but there has be an understanding of the wider issues in recruiting overseas people including the ethical ones. Clearly if a reformed and effective manufacturing base is established by this government, then the issue of low productivity must be addressed recognising the complex mix of factors that creates it. This would also have significant impact on the technical and vocational curriculum in FE colleges which will require colleges to inform students of the issues involved: the rationale for greater use of work experience programmes and the creation of realistic working environments in colleges would provide students with a greater understanding of the work place and the factors that contribute to low productivity and how they can improve it. Again this puts Further Education Sector and apprenticeships centre stage in producing the qualified and informed workers of the future. Britain is at present the fifth-largest economy but is tenth in competitiveness according to the World Economic Forum – a figure that is continuing to decline. Britain invests far less in training than its European counterpart and cuts back even further during recessions. Poor quality management and leadership in manufacturing further weaken competitiveness and undermines any chance of improvement. One depressing fact is the poor state of broadband coverage and the development of 4G and 4G+ technologies in this country. The country broadcasts it is the 5th richest in the world but it is 54th on the broadband coverage and capacity. This seriously undermines its competitiveness and productivity. Couple this with the poor record of OECD skills in mathematics and science then the future for this country is dire. What makes this worse is the inability of the government and its departments to acknowledge and act on this woeful state. Manufacturing contribution to the national economy was 41% in 1948 falling to 20% in 1997 and to 10% in 2016. If the country is stupid enough to leave the EU the situation will be worse particularly in the area of skills gaps and shortages, investment, R&D investment etc. Let’s hope sanity and realism reigns. Productivity and competitiveness are very important contributing factors for success in the global economy. Evidence, both national and international shows that Britain does not have an effective strategy on manufacturing. Poor working environments contribute to low competitive and productivity levels and research has shown a number of factors contribute to this element including ambient conditions such as work areas and there size, appearance and attractiveness, noise levels, temperature, humidity etc. Also the location of the work place is becoming a crucial factor e.g. the transport systems that the workers have to use to get to and from work and the hospitality facilities in the surrounding area to the work place. Equally concerning is the continued decline by company’s investment in Research and Development (R&D) coupled with the government reducing the investment in science, engineering and technology. Investment in R&D and science/engineering and technology has declined since the early 2000s. This is a really depressing fact and will greatly weaken both the competitiveness and productivity levels in this country compared with our competitors in the global economies. Posted 22 November 2015 by Richard & filed under Viewpoint. The advent of open learning systems (OLS) that utilise the advantages of the internet clearly offers many opportunities to widen participation in education and training and make a major contribution to lifelong learning. The associated technologies allow increased distribution and access opportunities to potential learners across the globe and reduce/remove many barriers that restrict participation for many individuals. This can provide no/low-cost access and use with little or no restrictions for the learner. A multitude of technologies and techniques have been developed to suit the learner’s situation and needs. Massive on-line learning programmes are available across a wide range of subjects many of which are freely downloadable. The quality of the teaching material can be superior to class room based teaching and learning especially when the local providing institutions are constrained by resources. Clearly these positive statements need to be qualified and the issues are mainly associated with quality assurance for the programmes, access issues and the learning resources themselves. Obviously strict standards must be in place coupled with rigorous inspection and monitoring regimes in order that quality is assured and the programmes deliver what they say they will. It must be recognised that traditional quality assurance mechanisms that exist in more formal face to face environments cannot be applied to these emerging widely distributed and open on-line learning methods. New approaches have to be created and require organisations like OECD, EU, and other organisations and consortia who are offering provision to establish agreed international standards and inspection techniques. Networks and consortia of universities and colleges are now offering open learning programmes recognising the undoubted advantages of these approaches and that will enhance their provision. Clearly the ultimate success of open learning depends on the availability of high quality broad band in terms of geographical coverage and band width. There are still areas in Europe that have poor coverage and inadequate band width. Clearly from my perspective and interest in the teaching of technical and practically based subjects is the ability of these technologies to play their part in improving and delivering a relevant pedagogical experience. For successful teaching of practical and manual skills the learning environment must be as realistic as possible. The technologies can obviously complement and add value to the traditional formal methods where the learners have access to laboratories and workshops in colleges and training providers. The visual and audio on-line material can provide a much richer detail and resultant experience that might not be available in the more formal setting of the classroom, laboratories and workshops because of resource limitations. The technologies can offer a range of techniques that will engage and enhance the learning experience including interactive visual/audio presentations and practical demonstrations that will complement the essential local hands on approach of the learner, information and work sheets, tests and assessment material and an increasing number of specialised apps (applications). The material can be downloaded and will complement book based/lecture material. However real challenges still exist for the lone and isolated learner who might not have access to laboratories and workshops and hence not have the benefit of an essential realistic working environment. The development of more sophisticated modes of online interactivity will create more realistic working environments (RWEs) which would greatly enhance the learning experience in this mode in the future. I still have some reservations, albeit minor, that these technologies will never create the real hands on experience that I feel should still be realised for learners in gaining technical and practical skills. Open educational resources (OERs) and open educational practices (OEPs) will increasingly make a major contribution to the teaching and learning of theoretical and practical skills in the future. The Chartered Institute for Plumbing and Heating Engineering (CIPHE) have created an excellent e-learning portal for its members. It provides high quality learning material for plumbers and students and shows the potential of Open Learning. Modules are ten to sixty minutes duration and many are created and sponsored by manufacturers. The address is www.ciphepd.org.uk and is well worth looking at. Posted 9 November 2015 by Richard & filed under Viewpoint. Yet again parliament is discussing the future of the Further Education Sector. During this period of austerity the topic is very much alive as the government tackles or should that be attacks public sector spending. 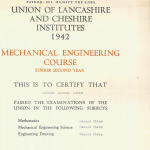 FE has always been an easy target, little understood or given the recognition it deserves. Massive cuts are being introduced across college budgets e.g. 24%+ at Liverpool College and as a result staff are being made redundant and more are employed on fixed term or zero hour contracts. A recent report highlighted the massive reserves that universities have compared with the paucity of funds that the colleges have pointing out that 25% of colleges will be bankrupt with the next year! This is bad enough but a number of politicians are suggesting that the sector is increasingly irrelevant arguing that the other sectors of education and the private sector can make the provision. The appearance of academies, specialist schools, free schools and the like and the raising of the school leaving age to 18 does not help the case for colleges. Also the number of colleges in the country continues to decline rapidly. Many politicians seem to imagine the provision can be developed and delivered in these other institutions, again reflecting their ignorance of technical and vocational education. Sadly it reflects the fact that technical education and training and its providers have been treated as second best for many decades. 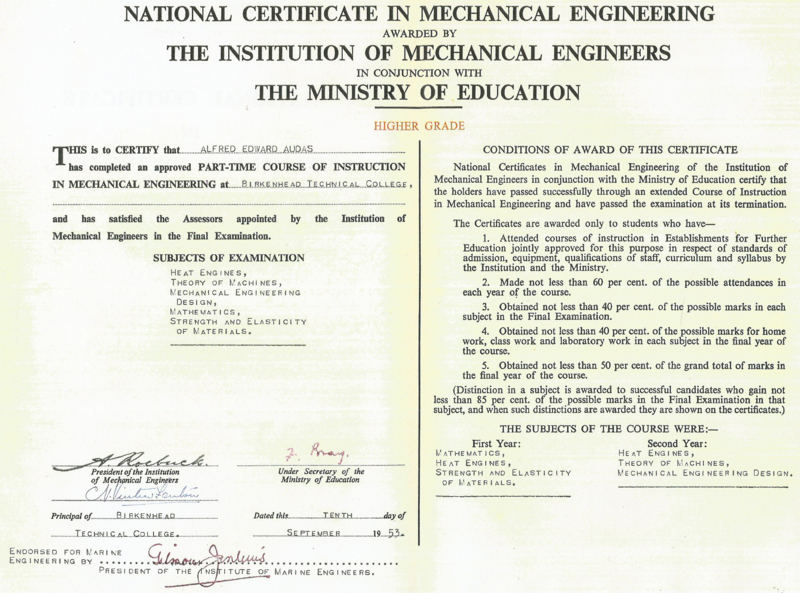 Since the Great Exhibition technical education has witnessed many false dawns, been bombarded with volumes of empty rhetoric with little long term improvement, and this situation continues today. If the government is serious about rebalancing the economy and establishing an effective revitalised manufacturing base it must fully recognise the key role the sector must play in this endeavour. The government should recognise that colleges and other training providers must be significantly involved in the development of high quality apprenticeship programmes with employers and major programmes in technical and vocational education and training. College staff must lobby their professional organisations and employers they work with to make it clear to politicians of all persuasions that the sector is essential in creating the highly qualified workforce of the future and play a major part in improving the current low skills levels so prevalent in this country. A fundamental review and reform of education and training in this country to be carried out to once and for all establish an effective FE sector that is recognised, secure, and well-resourced and given equal status with schools and universities. College staff, particularly Senior and members of the Governors to lobby local MPs and get them to visit the colleges regularly to see their work. Colleges to work together with the organisations that represent the sector again to constantly lobby all the appropriate parties. Get rid of the differential funding regimes between young and older students and those pursuing different modes of attendance/delivery. Treat all the sectors fairly particularly in their resources. The average funding for FE students is £2,000 as opposed to £9,000 for university students. Tackle the massive surpluses that universities hold and transfer some of the money to colleges. The message to all interested parties is to tap all possible networks in order to broadcast the importance of the sector and its work or it will be consigned to history.